Download "Need to Know. New. 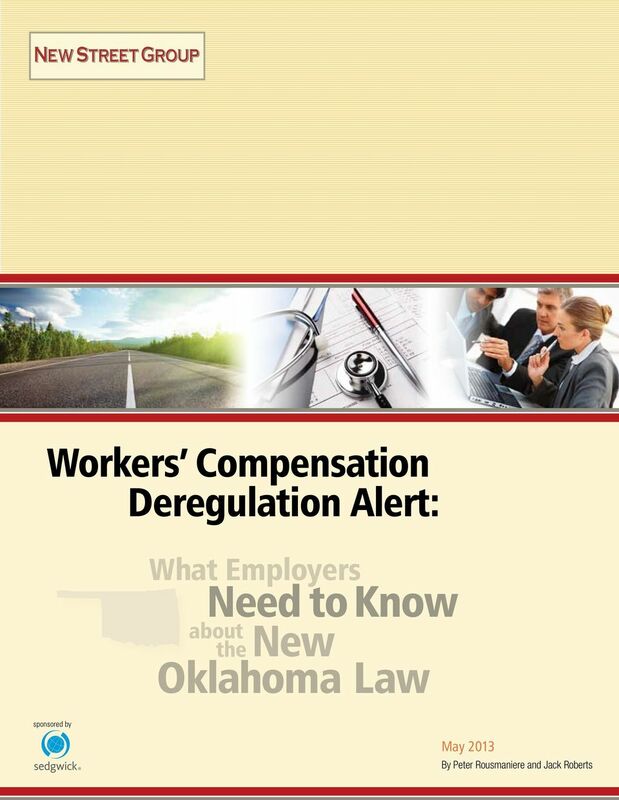 Oklahoma Law"
2 What Employers Need to Know In early May, Oklahoma enacted what may be the most inventive workers compensation legislation of any state since the early decades of the 20th century. The new law, SB 1062, allows any employer the option to exit the state s statutory workers compensation system. Before the governor signed the legislation into law on May 6, 2013, only Texas allowed employers to opt-out of its statutory workers compensation system. 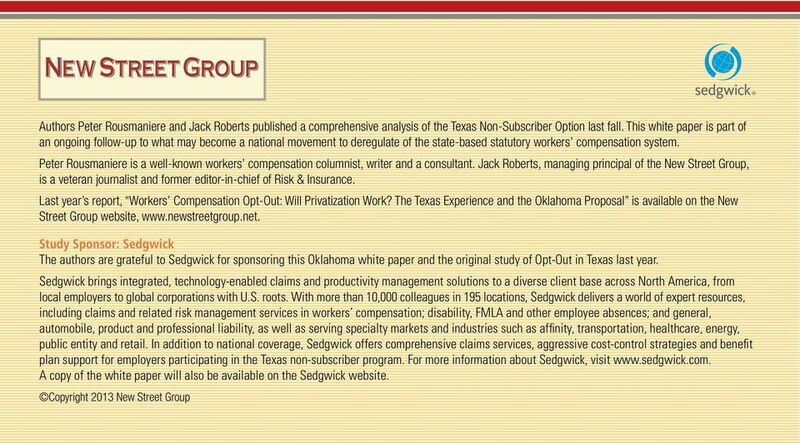 The differences between the Texas non-subscriber system and the Oklahoma law, part of a larger series of changes to the state s workers compensation system, are substantial. SB 1062 offers Oklahoma employers that choose the alternative to the state system the opportunity to substantially reduce work-injury costs and avoid both the statutory system s extensive regulation and litigation risk. For workers, important questions about benefits and process exist. The law is awaiting an early review by the Oklahoma Supreme Court. 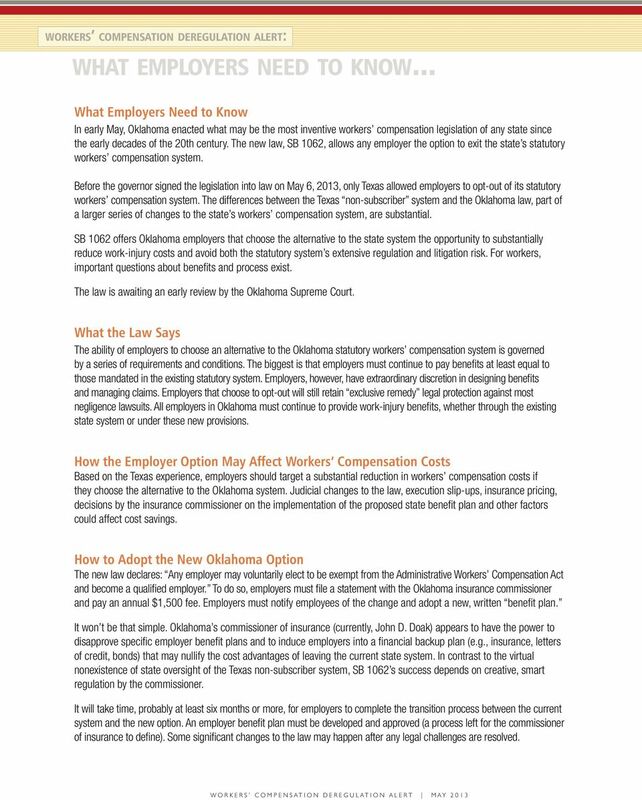 What the Law Says The ability of employers to choose an alternative to the Oklahoma statutory workers compensation system is governed by a series of requirements and conditions. The biggest is that employers must continue to pay benefits at least equal to those mandated in the existing statutory system. Employers, however, have extraordinary discretion in designing benefits and managing claims. Employers that choose to opt-out will still retain exclusive remedy legal protection against most negligence lawsuits. All employers in Oklahoma must continue to provide work-injury benefits, whether through the existing state system or under these new provisions. How the Employer Option May Affect Workers Compensation Costs Based on the Texas experience, employers should target a substantial reduction in workers compensation costs if they choose the alternative to the Oklahoma system. Judicial changes to the law, execution slip-ups, insurance pricing, decisions by the insurance commissioner on the implementation of the proposed state benefit plan and other factors could affect cost savings. How to Adopt the New Oklahoma Option The new law declares: Any employer may voluntarily elect to be exempt from the Administrative Workers Compensation Act and become a qualified employer. To do so, employers must file a statement with the Oklahoma insurance commissioner and pay an annual $1,500 fee. Employers must notify employees of the change and adopt a new, written benefit plan. It won t be that simple. Oklahoma s commissioner of insurance (currently, John D. Doak) appears to have the power to disapprove specific employer benefit plans and to induce employers into a financial backup plan (e.g., insurance, letters of credit, bonds) that may nullify the cost advantages of leaving the current state system. In contrast to the virtual nonexistence of state oversight of the Texas non-subscriber system, SB 1062 s success depends on creative, smart regulation by the commissioner. It will take time, probably at least six months or more, for employers to complete the transition process between the current system and the new option. An employer benefit plan must be developed and approved (a process left for the commissioner of insurance to define). Some significant changes to the law may happen after any legal challenges are resolved. 3 Initially, it will be more complicated than just sticking with the current state system, but the benefits to the employer and perhaps to the employee may be quite substantial. Claims Management The new law replaces important claims management elements of the workers compensation system with significant reforms. Benefit plans will come in two alternative formats. One format is state based; the other is based on federal law the Employee Retirement Security Act (ERISA). The ERISA alternative is not expressly stated in the law, but inferred. Because of issues that were raised in the 2012 legislation, the lack of a specific mention of ERISA was purposeful because of confusion between ERISA and the Affordable Care Act among some lawmakers. The new law was designed to allow an alternative ERISA plan, by inference, in addition to the state-based plan prescribed by the law. The state-based plan must include a description of benefits provided to injured workers and how workers can access those benefits. Benefits must be equal to or better than those offered in the statutory Oklahoma workers compensation system. ERISA-based plans must also provide a description of benefits and how to access them. An essential feature of any employee benefit offering is a predictable process for dispute resolution. 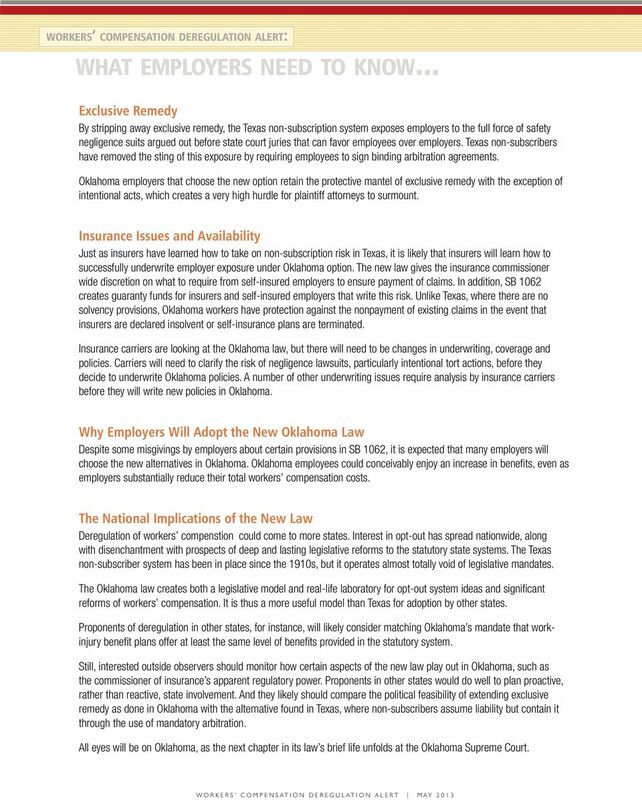 For Oklahoma employers that use a state-based plan, the new law spells out a dispute resolution process, which begins internally within the employer. An ERISA plan includes a dispute resolution process that virtually bars lawyer involvement. It s anticipated that there is a strong possibility of legal objections to the state plan in the Oklahoma state courts. However, state courts have no jurisdiction over ERISA, so any legal action must come in the federal courts. 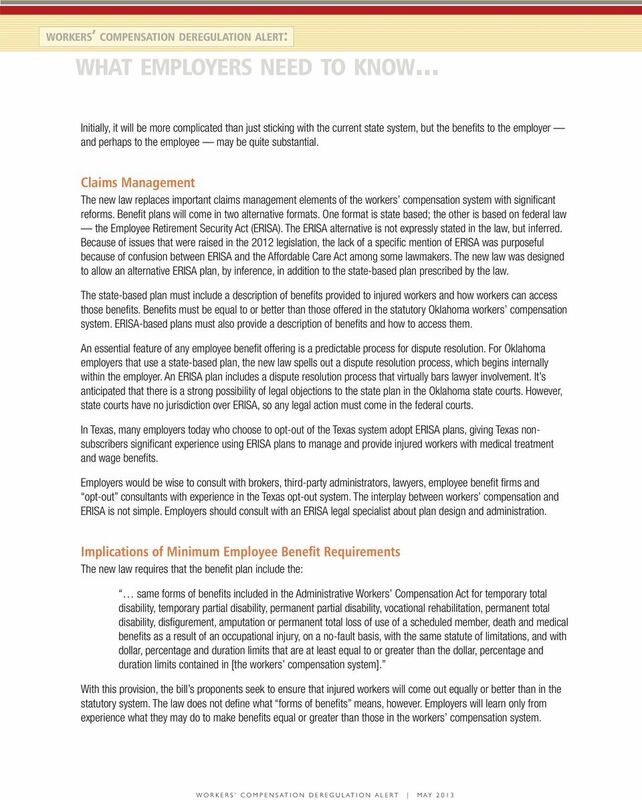 In Texas, many employers today who choose to opt-out of the Texas system adopt ERISA plans, giving Texas nonsubscribers significant experience using ERISA plans to manage and provide injured workers with medical treatment and wage benefits. Employers would be wise to consult with brokers, third-party administrators, lawyers, employee benefit firms and opt-out consultants with experience in the Texas opt-out system. The interplay between workers compensation and ERISA is not simple. Employers should consult with an ERISA legal specialist about plan design and administration. Implications of Minimum Employee Benefit Requirements The new law requires that the benefit plan include the: same forms of benefits included in the Administrative Workers Compensation Act for temporary total disability, temporary partial disability, permanent partial disability, vocational rehabilitation, permanent total disability, disfigurement, amputation or permanent total loss of use of a scheduled member, death and medical benefits as a result of an occupational injury, on a no-fault basis, with the same statute of limitations, and with dollar, percentage and duration limits that are at least equal to or greater than the dollar, percentage and duration limits contained in [the workers compensation system]. With this provision, the bill s proponents seek to ensure that injured workers will come out equally or better than in the statutory system. The law does not define what forms of benefits means, however. Employers will learn only from experience what they may do to make benefits equal or greater than those in the workers compensation system. 4 It is anticipated that the federal appellate courts will be called upon to determine whether Oklahoma can impose on ERISA plans, typically immune from state interference, and require a package of minimum benefits. Still, Texas non-subscribers point the way in which benefits actually increase. Texas makes no demands on non-subscribing employers to offer any injury benefits, much less adhere to minimal benefit levels. Yet many non-subscribers there begin wage replacement on the first day of disability, dispensing with a waiting period, which is part of workers compensation law in every state including Texas. They also often remove a weekly wage replacement cap, which Texas and other states impose in statutory systems, typically set as a percentage of the state s average weekly wage. These new benefits can be substantial and important to workers. The Drivers of Cost Savings in the New Law Deregulation: Non-subscribers in Texas attribute their success in reducing work-injury benefit costs to their unfettered discretion on how they administer claims. Texas non-subscribers benefit from virtually complete elimination of litigation, for example, over whether to accept or deny a claim, the terms for receiving benefits and how to close claims. Texas employers also cite the elimination of regulatory oversight, evidenced in the removal of state-prescribed forms and exacting procedural requirements. When non-subscribers use ERISA plans, they are held to account for not acting capriciously or arbitrarily, but they are never called to task by a state agency or plaintiff attorney for nuances, improvisations or changes in stated policies. They can easily coordinate work-injury benefits with their other benefit plans, such as health insurance. They move the treatment of non-occupational conditions to their health plans. Those health conditions that impede injury recovery, such as diabetes, often become part of a workers compensation claim and can be very costly. Quickly, state courts will clarify the difference between a benefit and the conditions for receiving a benefit. Workers may be entitled, for example, to benefits for a permanent impairment as long as they demonstrate that the impairment persists and contributes to income decline. Their continued medical benefits could be conditioned on utilization review, approved medical treatments, and their employers selection of treating doctors. Most claims executives will grasp the value of broader discretion for setting the conditions for receiving benefits. Improved claims management: The employers ability to direct medical care may become the biggest driver of savings, especially, as is the case in Texas, if it gets employees back to pre-injury status quickly and results in faster return-to-work. Under the new law, employers gain complete discretion in defining what injuries are covered and designing a medical management program. 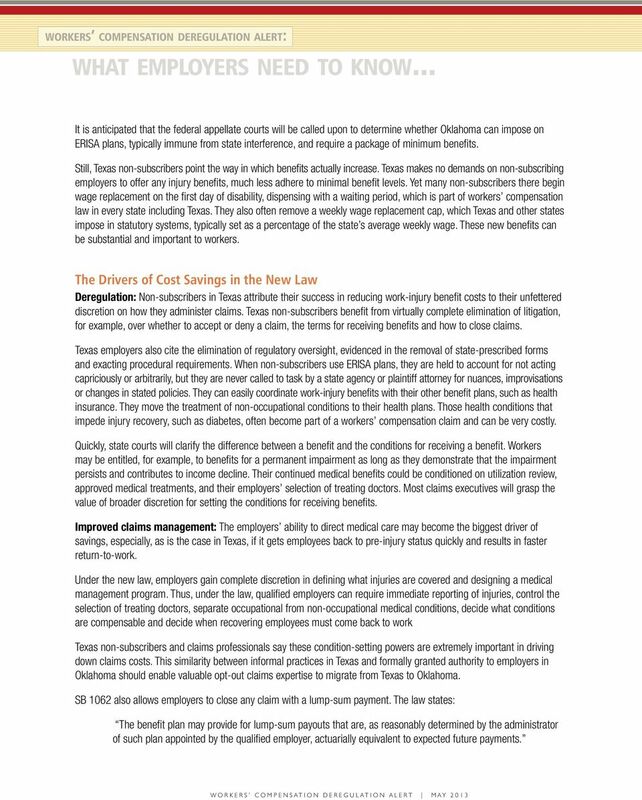 Thus, under the law, qualified employers can require immediate reporting of injuries, control the selection of treating doctors, separate occupational from non-occupational medical conditions, decide what conditions are compensable and decide when recovering employees must come back to work Texas non-subscribers and claims professionals say these condition-setting powers are extremely important in driving down claims costs. This similarity between informal practices in Texas and formally granted authority to employers in Oklahoma should enable valuable opt-out claims expertise to migrate from Texas to Oklahoma. SB 1062 also allows employers to close any claim with a lump-sum payment. The law states: The benefit plan may provide for lump-sum payouts that are, as reasonably determined by the administrator of such plan appointed by the qualified employer, actuarially equivalent to expected future payments. 5 Exclusive Remedy By stripping away exclusive remedy, the Texas non-subscription system exposes employers to the full force of safety negligence suits argued out before state court juries that can favor employees over employers. Texas non-subscribers have removed the sting of this exposure by requiring employees to sign binding arbitration agreements. Oklahoma employers that choose the new option retain the protective mantel of exclusive remedy with the exception of intentional acts, which creates a very high hurdle for plaintiff attorneys to surmount. Insurance Issues and Availability Just as insurers have learned how to take on non-subscription risk in Texas, it is likely that insurers will learn how to successfully underwrite employer exposure under Oklahoma option. The new law gives the insurance commissioner wide discretion on what to require from self-insured employers to ensure payment of claims. In addition, SB 1062 creates guaranty funds for insurers and self-insured employers that write this risk. Unlike Texas, where there are no solvency provisions, Oklahoma workers have protection against the nonpayment of existing claims in the event that insurers are declared insolvent or self-insurance plans are terminated. Insurance carriers are looking at the Oklahoma law, but there will need to be changes in underwriting, coverage and policies. Carriers will need to clarify the risk of negligence lawsuits, particularly intentional tort actions, before they decide to underwrite Oklahoma policies. A number of other underwriting issues require analysis by insurance carriers before they will write new policies in Oklahoma. Why Employers Will Adopt the New Oklahoma Law Despite some misgivings by employers about certain provisions in SB 1062, it is expected that many employers will choose the new alternatives in Oklahoma. Oklahoma employees could conceivably enjoy an increase in benefits, even as employers substantially reduce their total workers compensation costs. The National Implications of the New Law Deregulation of workers compenstion could come to more states. Interest in opt-out has spread nationwide, along with disenchantment with prospects of deep and lasting legislative reforms to the statutory state systems. The Texas non-subscriber system has been in place since the 1910s, but it operates almost totally void of legislative mandates. The Oklahoma law creates both a legislative model and real-life laboratory for opt-out system ideas and significant reforms of workers compensation. It is thus a more useful model than Texas for adoption by other states. Proponents of deregulation in other states, for instance, will likely consider matching Oklahoma s mandate that workinjury benefit plans offer at least the same level of benefits provided in the statutory system. Still, interested outside observers should monitor how certain aspects of the new law play out in Oklahoma, such as the commissioner of insurance s apparent regulatory power. Proponents in other states would do well to plan proactive, rather than reactive, state involvement. And they likely should compare the political feasibility of extending exclusive remedy as done in Oklahoma with the alternative found in Texas, where non-subscribers assume liability but contain it through the use of mandatory arbitration. All eyes will be on Oklahoma, as the next chapter in its law s brief life unfolds at the Oklahoma Supreme Court. NEGOTIATED WORKERS COMPENSATION PROGRAMS (NWCP) A win-win for Employers, Insurers, Union Employees, and their Joint Health Funds. Integrated STD, LTD, Workers Compensation and FMLA/Leave Management Every business understands that employee absences cost money. Fortunately, expert absence management can cut those costs substantially. Michigan No Fault Law Essential Knowledge for Hospital and Medical Office Personnel Why Learn About No-Fault? A Presentation for Third Party Payer Day Mt. Pleasant, Michigan November 21, 2014 Robert E.